The dragon children have found an unusual treasure: a column of ice with sparkling stones frozen inside it. Naturally everyone wants them. Together with dragon dad the players remove one ice ring after the other, and melt the ice column. This makes the sparkling stones fall down. But be careful: Only certain sparkling stones can be collected. Who will have the most sparkling stones at the end? 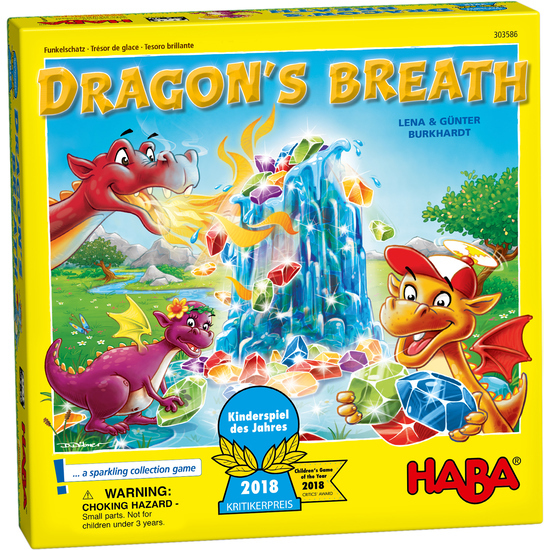 Contents: 1 dragon dad, 1 box base with 4 dividers, 1 game board, 4 dragon children, 9 ice rings, 90 sparkling stones (18 in each of 5 colors), 5 sparkling stone tiles, 1 ice floe tile, 1 set of instructions. Short game instructions: • Assemble game setting. Each player selects a dragonchild in a corner of the game board. • Place ice floe tiles in the center and pile up 8 ice rings (3 players, 9 rings) in a stack and fill with sparkling stones. Have a sparkling stone tile ready. • Play in a clockwise direction. One player plays the dragon dad. Starting with the player to their left, each player selects a sparkling stone tile. of the sparkling stone tile and stow them away in the cave of your own dragon child. Remaining sparkling stones go into the cave in the center. Pass on the dragon dad. • Determine the winner after the final ice ring. The player with the most sparkling stones in their dragon cave wins.